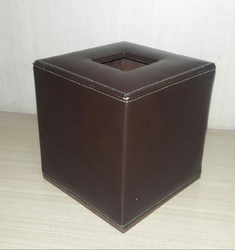 Black square Leather Tissue Cover, Size: 5.00" X 5.00" X 5.50"
Size: 5.00" x 5.00" x 5.50"
This is stainless steel tissue box available in different sizes according to the size of the tissue suitable for Hotels, Restaurants and at home on dinning Table and Washrooms . We are developing in Cane Tissue Box. We have in many sizes as per customer. MDF Boxes are manufactured by our Craftser. We use Pine MDF and imported material for hindges Lock System. A perfect blend of both the antique and modern home furnishings item, we provide our clients with a fascinating assortment of Beaded Tissue Box Covers. These beaded tissue box covers are available in various patterns, patch work and embroideries. 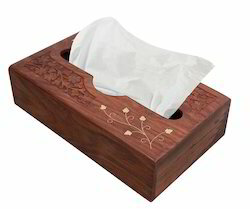 Kleenex tissue boxes are known for aesthetic designs, exquisite patchwork and the fine craftsmanship.